Michael McCormack has taken over Barnaby Joyce’s federal infrastructure and transport ministerial portfolio along with the Nationals Party leadership. McCormack will combine the role with that of small business minister, taking that portfolio into Cabinet, and deputy prime minister. The move marks the ninth change of transport minister in 20 years and the fifth in five years. Industry and government organisations welcomed him to his new responsibilities. The Australian Trucking Association (ATA) chair Geoff Crouch says that, from personal experience, McCormack is a good choice. "Michael McCormack will bring great drive and determination to the infrastructure and transport portfolio," Crouch says. "I have known Michael for more than 20 years. He is a proven advocate for small business, and regional and remote Australia. I’m confident he’ll bring this drive and determination to supporting the road transport industry." Crouch notes McCormack demonstrating an understanding of the importance of the road transport industry in parliament in 2012, saying: "If it needs to be carried, carted, dumped, hauled, moved, shifted or transported, there is every likelihood a truck or trailer will be the most economical, fastest and most reliable way of getting it from point A to point B." Crouch believes McCormack represents an opportunity to focus the transport agenda on improving safety and boosting productivity. "Trucking is critical to connecting Australians with goods and exports, as Michael McCormack knows well," Crouch says. "But road transport must be safe, and must keep Australian businesses competitive in global markets. "The ATA looks forward to engaging with the deputy prime minister on the need for independent and expert safety investigations of heavy vehicle accidents by the ATSB, on implementing the new laws on chain of responsibility, and ensuring our fatigue laws and rest areas are focused on saving lives. "We also need to enable economic opportunity by boosting productivity, improving road access, building better and safer roads and eliminating over-regulation." For its part, the Australian Logistics Council (ALC) is pleased McCormack will also assume the transport, thereby keeping related issues high on the Cabinet agenda. "It is pleasing that the second most senior figure in the Government will retain portfolio responsibility for this crucial area, given the importance of developing transport infrastructure to support national supply chain efficiency and build Australia’s export capacity," ALC MD Michael Kilgariff says. "As an industry leader on freight and supply chain policy, ALC always seeks to have a cooperative and productive relationship with the key ministers in portfolio areas that impact our industry. "ALC also acknowledges the personal commitment shown by the former Deputy Prime Minister, Hon. Barnaby Joyce MP, in bringing the Inland Rail project to fruition. "Minister McCormack comes to the portfolio at a critical juncture. After decades of discussion, work on the Inland Rail project is now finally underway, thanks to the investment of $8.4 billion in last year’s Federal Budget. It is vitally important that momentum is not lost in delivering this transformative project. "We similarly look forward to working with the new Minister to ensure that the National Freight and Supply Chain Strategy to be released in 2018 effectively addresses those industry priorities set out in Freight Doesn’t Vote, the ALC submission to the Inquiry into National Freight and Supply Chain Priorities." The issues will also be a central focus throughout ALC Forum 2018, which will be held at Royal Randwick in Sydney from March 6-8. "The National Freight and Supply Chain Strategy is not just an industry blueprint, but a significant national economic initiative. It is imperative that we take action now to get the policy settings right, so we can meet our growing national freight task." Kilgariff says. Victoria’s industry representative body also backed the move. 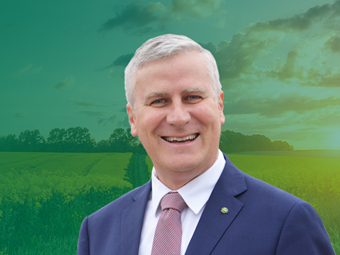 "The Victorian Transport Association wishes to congratulate Michael McCormack on his election as Leader of the Nationals, and his appointment as deputy prime minister and minister for infrastructure and transport," CEO Peter Anderson says. "We have worked closely with his predecessors in these vital portfolio areas, and we look forward to working with the Minister and his team to develop policies and solutions that improve conditions for freight and logistics operators throughout Australia." The National Heavy Vehicle Regulator (NHVR) welcomed the, with NHVR chair Bruce Baird saying he looked forward to working with McCormack to deliver the regulator’s ongoing reform to heavy vehicle safety and productivity. "On behalf of the NHVR staff, our chief executive and board, I congratulate Michael," Baird says. "I look forward to working with the incoming Minister to deliver consistency across Australia’s borders, reduce red tape for heavy vehicle operators and boost road safety for all road users. "In particular Michael has been a strong advocate for regional communities and I look forward to his leadership as a shareholding Minister of the NHVR." Baird also thanked outgoing minister Joyce for his ongoing support of the NHVR and heavy vehicle industry. Victoria’s industry representative body also backed the new transport minister.